How Quiet is the Assault AirRunner? How Quiet is the Xebex Runner? How quiet is the Origin SpeedFit? How Quiet is the Pro Gear HCXL 4000 Treadmill? How Quiet is the Simpfree S8100? How Quiet is the SportsTech Office Desk Treadmill? Treadmills are rarely quiet – when in use they make a lot of noise. When you’re tired your running form can quickly deteriorate into a heel first gait which causes your feet to hit the treadmill belt very noisily. This is caused by your entire body weight being driven through your heel with none of the cushioning that comes from landing on the middle of your foot. If your treadmill is tucked away in the spare room your family aren’t going to thank you for going for a noisy early morning run on it. If you’re looking to replace your current treadmill or are looking to buy your first treadmill then it is a good idea to consider a running machine which is quiet, as this will help keep the peace in your home. Designed with sound reduction in mind. Featuring a quiet engine and silicone dampened frame to reduce vibrations. A specially designed quiet drive engine. Your feet hitting it as you run. They reduce (or completely eliminate) motor noise. They minimize the impact noise created by footfall. This is why we feature several curved running machines below. Curved running machines do not use motors and they are designed in a way which encourages you to run more naturally, landing on the balls of your feet. This minimizes the impact on your joints and makes for a smoother running style which reduces noise. Unlike motorised treadmills curved runners have no maximum speed, you can literally sprint full pelt on them, the only thing that limits their speed is you. They also help you burn up to 30% more calories than a flat treadmill. This is because their unique design engages more of your leg muscles. The downside to this is that running on a curved treadmill will feel more physically taxing. The whole point of training is to force your body to adapt and improve – any curved treadmill will definitely help you to improve your fitness. If that hasn’t put you off getting one, read on (if that has put you off don’t worry – we also feature some quiet motorized treadmills further down the page). Part of the reason why most treadmills are very noisy is that they contain electric motors which power the belt. The Assault AirRunner takes the top spot in our list because it is super quiet due to its lack of an electric motor. It doesn’t run on electricity but instead uses your energy – it is powered exclusively by your legs. ﻿ This means that it mirrors the experience of running outdoors. The curvature helps reinforce a correct heel to toe running gait. Unlike a typical treadmill, the Assault AirRunner requires no electricity. The monitor is powered by electricity generated from using it. No need to press buttons to speed it up or slow it down, simply run faster and the belt will instantly accommodate your change in pace. Weighing 127kg it is significantly lighter than a lot of motor powered treadmills. It is also very simple to put together, the treadmill part comes as one unit which you can pull out of the box and start running on immediately if you wish. There are only two arms and a support rail to attach along with the calorie computer which has a couple of wires that require plugging into the right places. It can be all setup and ready to go in less than 5 minutes. It has no motor so it’s already got rid of one of two of the key causes of treadmill noise. Footfall noise is reduced due to the curvature. A more natural gait means that when your feet hit it they won’t be hitting it as hard as they would on a flat treadmill thereby reducing the noise of your run. Obviously, the faster you go the more noise you will make, we can’t guarantee that you can do an all-out sprint in complete silence. However, a quick YouTube search for ‘people sprinting on curved treadmills‘ reveals that the amount of noise they make at top speeds (the curved treadmill record is 23.5mph) is minuscule compared to the noise a normal flat treadmill would make at even half the speed. The video below shows a man running on the Assault AirRunner, while there is a good bit of background noise you can still get a good idea for the amount of noise it generates when being used. As you can hear the only real noise is generated by the belt movement. We have it on good authority (by a man who has used many curved runners) that the Assault AirRunner gives less resistance than other curved treadmills allowing you to get up to a good speed easily and also generating less noise at higher speeds as there is less resistance. So it’s for good reason that the Assault AirRunner takes top spot in our list of the best quiet treadmills. The Xebex runner is not too dissimilar to the Assault AirRunner, the most notable difference being the price. Curved treadmills are a very new and innovative product and their price tag reflects that, if you haven’t got money to burn then the Xebex is a cheaper alternative to the Assault AirRunner (though it still commandeers a fairly hefty price tag). Xebex are a relatively low profile brand within the fitness industry. They haven’t got a lot of consumer visibility, yet you more than likely have used some of their gym equipment at some point as the family-run company makes loads of gym gear for hundreds of companies in the fitness industry. While their prices may be cheaper than some of their competitors the quality of their products is just as good. 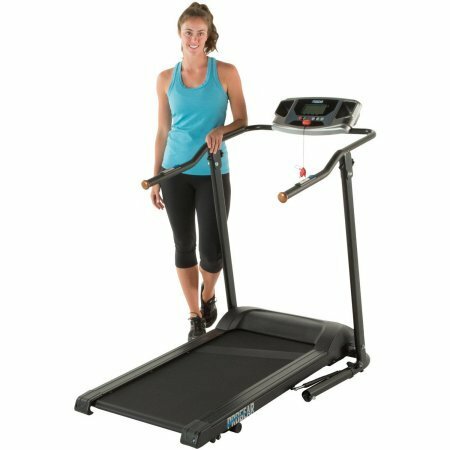 With no motor and a curved surface to encourage you to run with a more natural (and less noisy) gait, the Xebex Runner is another great option for anyone looking for a quiet treadmill. Weighing in at 143kg it is heavier than the Assault AirRunner so is less manoeuvrable, but this extra weight does give it the strength to bear up to a massive 700lb if needs be! To be honest we haven’t actually tested a Xebex first hand (or first feet) however having spent hours pouring over videos and user reviews of it we feel confident that we can say it is much quieter than a standard motorized treadmill. As with the Assault AirRunner the Xebex has no motor and its curved surface helps improve your running gait thereby reducing the sound of heavy steps. While it’s by no means entirely silent it’s a great choice for anyone wanting to significantly reduce the amount of sound coming from their home gym. The third and final curved treadmill to make it into our list is the Origin SpeedFit. By now you should be getting the idea – curved runners are the premium option for anyone looking for a quiet treadmill. They don’t run on electricity, have no motor and their curved shape reduces the impact on your knee joints and minimizes unnecessarily heavy footfall. Curved treadmills are designed to reward efficient runners, and make life difficult for inefficient runners – this means that using one is likely to quickly help you improve your running gait. To be honest it’s hard to notice any distinguishable difference between the amount of sound this runner makes vs the amount of sound the Xebex makes. They seem very similar in their noise output. Not many people will be able to sustain that kind of pace for very long so it is fair to say that this treadmill should make a good bit less noise than it does in the video. The Pro Gear HCXL 4000 is a firm favourite with quiet electric treadmill aficionados. The stand out feature is it’s 1.5 horsepower high-torque engine which uses their special quiet drive technology to ensure that it causes minimal sound disruption. It is limited to a maximum speed of 4mph so is only suitable for slow jogs or brisk walks this makes it a good option for anyone looking to get a bit of exercise during the working day. It may not be ideal for anyone wanting to train for a marathon or anything which requires breaking a massive sweat! It weighs 120lb (54kg) and with it’s reinforced frame and sturdy safety handles it can handle up to 400lb (180kg) in user body weight making it ideal for weight loss programs. It also folds up for easy storage if you don’t have space at home to keep it out all the time. The Pro Gear HCXL has a 5-year motor warranty which is rare for any treadmill, so this gives you an idea of the quality of the motor. The Pro Gear HCXL 4000 is one of the quietest electric running machines available thanks to its quiet drive engine combined with the fact that it doesn’t go beyond 4mph thus reducing impact noise from heavy steps. The Simpfree S8100 is a super quiet electric treadmill with a top speed of 8.6 mph. 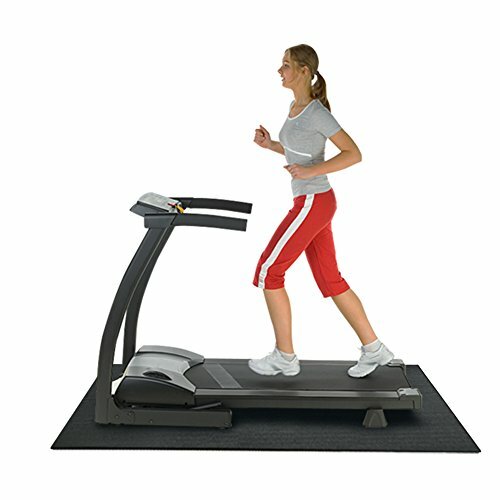 It features a ‘delicate’ electric motor which has been designed specifically with avoiding noise disruption in mind, you will notice that this is far quieter than pretty much any other electric treadmill available (remember that the bulk of treadmill noise is caused by your feet striking it so see our tips on reducing treadmill noise below). The steel frame is also built with noise in mind; it features silicone dampening to dampen vibrations while also helping to protect your joints. It features a mobile app which you can sync with the treadmill to take your training to the next level and keep your training plan on target. This treadmill was designed with the aim of keeping noise disruption down. 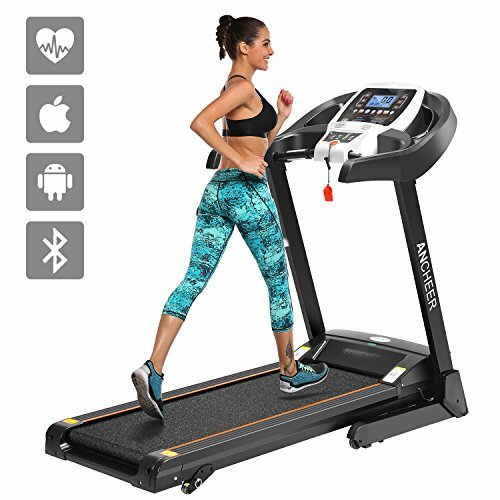 Sure it’s by no means completely silent however the silicone dampened frame and specially designed electric engine are two noise reducing features that you rarely get in other treadmills so this is a great choice for anyone looking for a far quieter than average treadmill. If you want a quiet treadmill that can be used for serious high-intensity training then a curved treadmill is what you should go for. However if you either don’t have the budget for that or you want something far simpler then there are some good motorized options available. The SportTech office desk treadmill is designed to fit under your office desk (hence the name). Consequently, it doesn’t have a big noisy electric motor. This means that you can easily get some casual exercise in at your desk or in your home without disturbing everyone. With a top speed of 7.1km this treadmill isn’t suited for people who are looking to smash PB’s and break records, but if you are looking for a way to include to exercise in your daily routine then this is a good option. For an electric treadmill, the SportsTech is pretty quiet. It only has a small engine (capable of powering the treadmill to a maximum speed of 7.1km/hour which doesn’t make much noise compared to bigger electric treadmills. It’s not curved so footfall noise will be more noticeable than it is on curved machines. Yet due to the fact that its max speed is relatively low the noise created by your feet hitting it at its top speed of 7.1 km/h will be nowhere near as significant as it would be on faster machines. All in all this treadmill is far from silent but it’s about as quiet a motorized treadmill you are going to get. It’s a great choice for a home gym or even an office gym won’t disturb your colleagues when in use. If you’ve got your treadmill set up in a shared flat, chances are that no matter how quietly you run, even if you’re using a motorless curved running machine, somebody next door will at some point hear you. Fortunately, there are some things you can do to soundproof your treadmill. The main cause of treadmill noise is the vibrations generated by running on it. These vibrations travel through the machine and into your floor and through your walls. To make your treadmill quieter you need to dampen the vibrations coming from it. All you need to do is buy a good quality treadmill matt like the one below and place it underneath your treadmill. The thicker the matt the better it will be at dampening vibrations. Regular belt lubrication is important for any treadmill owner. This will extend the life of your treadmill. Depending on the type of treadmill you have (curved or one with an electric motor) the process for lubricating the belt will differ. Get some silicone spray such as WD40. Lift the belt up from the treadmill – simply slide your fingers under the belt and lift to create a small space. Spray the silicone underneath the belt. Do this on both sides of the belt. Turn the treadmill on and let it run at a low speed for 5 minutes. Repeat this every 4 months to keep your treadmill feeling smooth. Curved treadmills are a little more complicated. Lubrication methods vary from manufacturer to manufacturer so check your user manual before you start spraying away. Lubricating your treadmill will help it to run more smoothly, making for a more enjoyable running experience. It will also minimize any sounds that could have been caused by your belt sticking to the treadmill. If you are using a motorised electric treadmill the choice of belt can help minimise sound. Most belts are very thin and do nothing to dampen vibrations however some treadmills use thicker belts which are useful for reducing noise transfer. Speak to your manufacturer and see if there is a thicker belt available to install on your treadmill. As we have mentioned numerous times already in this article heavy footfall is the main cause of treadmill noise. There are plenty of things (above) that you can do to dampen the impact of your footfall however the best way to reduce the impact of your steps is to fix your running gait. If you strike the ground with your heel when running you will create a considerable amount of noise (almost like someone punching the treadmill as hard as they can) as the full weight of your body hits the treadmill with no cushioning. If you switch to striking the ground with the mid-part of your foot you will make significantly less noise to the point when your running is almost inaudible. This is because your foot cushions the impact of your weight like a suspension system when you use a midfoot running style. Adjusting your running style can take time but it’s definitely worth learning how to run using midfoot striking as this is better for your knees, better for your treadmill and will cause much less noise. If you run using shoes with thin flat soles there is very little cushioning so the treadmill takes the full impact of your steps which creates a louder noise than it otherwise would. A lot of trainers which are designed specifically for running feature shock-absorbing heels which reduce the impact of your feet striking the floor. They also reduce the impact on your knees too which helps you to enjoy running for longer without developing an injury. Investing in a pair of good quality running shoes with a thick shock absorbing sole will help reduce the noise your make using your treadmill, especially if you also focus on improving your running gait too. Loose nuts and bolts can cause your treadmill to rattle when in use, making sure that they are tight will help reduce treadmill sound. Motorized treadmills run on bearings. If the bearings have worn down they can make a lot of horrible squeaky noises! When this happens they need to be replaced. Getting to the bearings isn’t always an easy job and can require taking a lot of your treadmill apart. If you’re not confident doing this ask your supplier if they can recommend someone to do it for you. Location is everything when it comes to reducing sound transfer. If your treadmill is located in an upstairs bedroom with hollow stud walls and an uninsulated floor then the sound will leak out of there with ease. Treadmills should be located on the ground floor if possible to minimize vibration transfer. The perfect place for a treadmill is somewhere like a garage. Garages usually have solid brick walls and concrete floors which reduce the transfer of sound and don’t amplify noise as hollow studs walls sometimes can. It is also important to think about where in a room you place it. Putting it up against a wall seems like a natural and sensible choice however this can amplify vibrations which vibrate directly off the wall, it also means vibrations will more readily travel through walls and into adjacent rooms. If possible (we know not everyone has the space to spare for this) position your treadmill in the centre of your room to help reduce the noise levels. Thanks for reading, I hope that this article has helped you either find a silent treadmill or make your existing treadmill less noisy.